Greenbriar at Fox Ridge is situated in scenic Morris County, New Jersey. This gated 55+ community offers distinctive amenities in an upscale location with small-town character. Built by Lennar, this community will contain 336 condominiums upon completion. The condos are situated in elevator buildings with secured underground parking. Set among a rolling countryside, yet conveniently located with easy access to major highways, residents will have no problems traversing the surrounding areas. Numerous golf courses and thousands of acres of parkland and public spaces, including lakes, surround Greenbriar at Fox Ridge. However, residents won t have to travel far to enjoy recreational pursuits as the community offers a charming clubhouse with an exciting lineup of amenities. The 16,000 square-foot clubhouse at Greenbriar at Fox Ridge evokes a rustic ski lodge ambiance. The fitness center includes strength-training and cardiovascular equipment, as well as a sauna and an aerobics studio. The indoor pool with spa is perfect for year-round use. In addition, residents can socialize over a friendly game of billiards, find their artistic side in the craft room, or attend a party in the ballroom. Outdoors, tennis facilities and bocce ball courts provide opportunities for fitness and fun, while the refreshing outdoor pool is a popular meeting place during the warmer months. Residents often gather for picnics in the pavilion, complete with a BBQ grill. Lennar started construction in 2008 and plans for 336 residences upon completion. The condominiums are located in three-story elevator buildings with underground parking. Sizes start at a cozy 979 square feet and go up to a spacious 1,997 square feet. Buyers can choose from seven different models with one or two bedroom layouts containing one-and-a-half to two-and-a-half bathrooms. These condos boast other desirable features like large rooms, private studies, living room and dining room combinations, breakfast nooks, huge balconies, and large laundry rooms. This community offers an exciting, vibrant atmosphere for the perfect combination of location and lifestyle. There are plenty of options to keep active retirees entertained and many possibilities to connect with their neighbors. In addition to the high-class amenities within the community, shopping, dining, golf courses and endless activities are just a short drive away. A part-time activities director plans a variety of entertainment occasions to suit every taste and lifestyle. Greenbriar at Fox Ridge also offers a variety of social clubs and special interest groups. Some popular activities and clubs include bingo, book club, card games, gardening, exercise classes, and much more. Residents are not only very welcome to join, but encouraged to start their own clubs and help grow creative pursuits. Greenbriar at Fox Ridge in Rockaway, New Jersey is minutes from the exciting Rockaway Townsquare Mall and a short drive will take residents to other shopping, dining, and entertainment options. Rockaway Township spans over 45.6 square miles and is home to lake communities and quiet, rural residential neighborhoods, yet is served by several major highways. Morris County has two dozen private and public golf courses and is also home to New Jersey's largest lake, Lake Hopatcong. Morris County offers plenty of cultural heritage, historic getaways, cultural venues, and parks and recreation. The neighboring communities of Denville and Dover are also great destinations. If residents want major excitement, Manhattan is just 35 miles away and, when their next destination is farther, Newark International Airport is a short drive away. Greenbriar at Fox Ridge is an ideal active adult community in Northern New Jersey. There are plenty of activities available in Greenbriar at Fox Ridge. Here is a sample of some of the clubs, activities and classes offered here. The condominiums are located in three-story elevator buildings with underground parking. Sizes start at a cozy 979 square feet and go up to a spacious 1,997 square feet. Buyers can choose from models with one or two bedroom layouts containing one-and-a-half to two-and-a-half bathrooms. All residences include parking in the underground garage. Some other features of the condos in Greenbriar at Fox Ridge are large rooms, private studies, living room and dining room combinations, breakfast nooks, huge balconies, and large laundry rooms. Greenbriar is really a must-see community. If you want a condo you have to come see the places here. You probably won't look anywhere else, it's that nice! The clubhouse is fabulous. The developer didn't spare any expense creating a masterpiece here. Even the landscaping is gorgeous, all year long! 55places.com is not affiliated with the developer(s) or homeowners association of Greenbriar at Fox Ridge. The information you submit is distributed to a 55places.com Partner Agent, who is a licensed real estate agent. 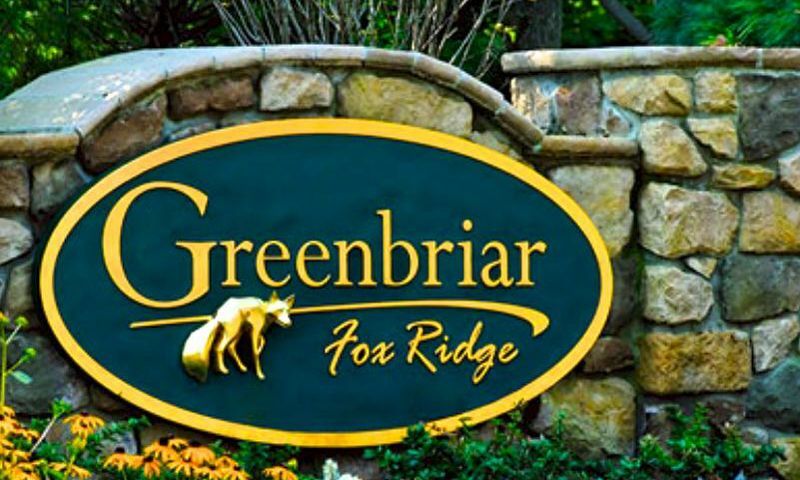 The information regarding Greenbriar at Fox Ridge has not been verified or approved by the developer or homeowners association. Please verify all information prior to purchasing. 55places.com is not responsible for any errors regarding the information displayed on this website.